In Beyond Katrina, Natasha Trethewey looks at the life, death, and ongoing resurrection of the Mississippi Gulf Coast. Trethewey is not the center of the story, nor is she alone in it. She speaks with a former mayor of her hometown of Gulfport, Mississippi, state legislators, a young waiter, an historian, and family members, among others. Besides bringing a fresh witness to the lives of those who were violently baptized by Katrina, the book concerns her brother who was incarcerated for trafficking cocaine. Before the storm, her brother had been a property owner. He’d invested time and money into renovating his rental homes. After the storm, he couldn't afford to repair them, so he lost everything. After the storm, she writes, “He drank on the porch in the evenings by himself. He sat watching the trucks go by on Highway 49. He found a hill where his cell phone worked and called to say, ‘Everything is gone.’"
Through her brother’s story, which incorporates his prison letters, Trethewey demonstrates that the monumental political contests fought over rebuilding efforts overlap the smaller but unforgettable battles fought by individuals. In her self-acknowledged desire to avoid the painful details, Trethewey is like a tiny bird about to fly away as soon as anything too human moves her way. The story about her brother is an intriguing meditation on family ties, on the silences we keep to keep family safe, and on the concessions of the heart we make for our emotional survival. 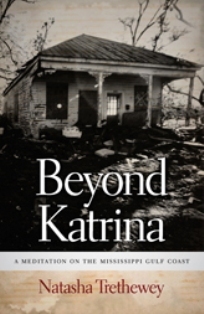 Beyond Katrina is also an account of conflicting narratives. After the storm, people rose from the water and took necessary steps, but not all moved in the same direction. Some, like those in North Gulfport, felt forgotten, but this sense of separation was not shared by everyone—not those who pledged allegiance to the Confederate States of America while attending the reopening ceremony at Jefferson Davis’s last home, nor by those in the business community, largely represented by the casinos. The Gulf Coast is becoming more commercial, less authentic, she believes. For example, at one casino, she orders a glass of wine—now more expensive. When she orders another, it comes back “as a completely different, lesser one.” When she points this out to the bartender, he shrugs, and then pours what she actually ordered. “It seems a kind of fake, bait-and switch culture of the new coast,” she writes. Each narrative is selective, and at times destructive to others, revealing that any kind of common narrative might be impossible.